Then her interests returned to quilting. The love affair was instant, and consuming. 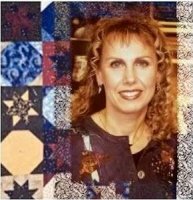 Ingrid Machtemes designs her own quilt patterns and teaches quilting classes for all levels of quilters and sells fabric and kits. Ingrid opened Quiltessential Co. in St. Albert in 2004, and since then it has expanded several times. Starting in a rented 900 square foot space, it was expanded and then finally moved to the present location on McKenney Avenue in 2011. Quiltessential Co. Inc. now has over 3000 square feet, a great classroom and over 4300 bolts of fabric. Ingrid is called the "Queen of Pre-cuts" as the store has such a huge inventory of charm squares, jelly rolls, layer cakes and other cut goods.